CANTON, Mass. 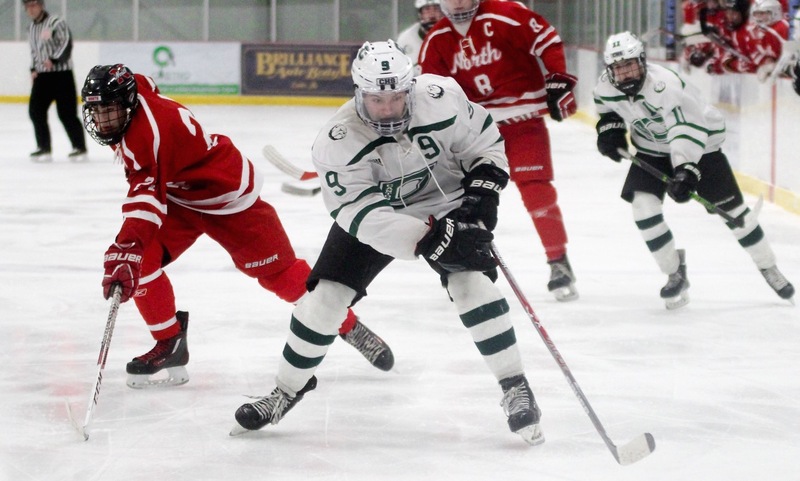 – With two of the top defensive units in Canton and Franklin going head to head, goal scoring chances were going to be at a premium. Franklin sophomore Jordan Dwyer took advantage of her chance, scoring the only goal of the game a minute into the final period to give the Panthers a 1-0 upset over Canton. While Dwyer provided the lone tally of the game, it was Franklin freshman goalie Natalie Stott (35 saves) that put the Panthers in position to get the win. 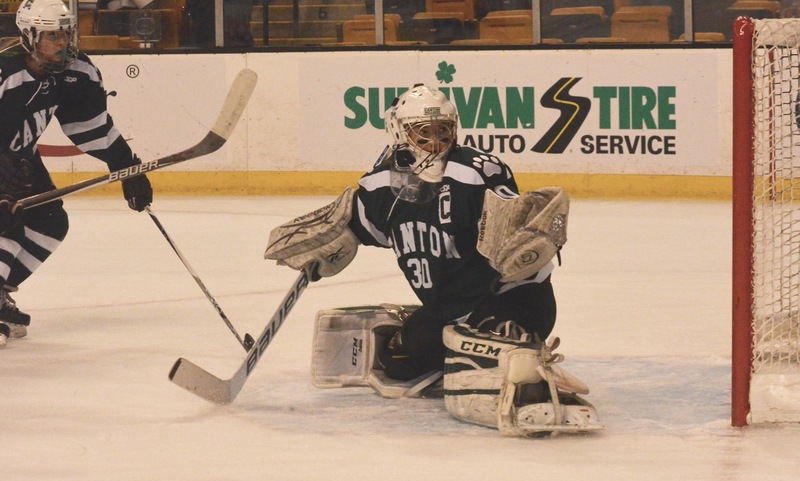 Stott turned away seven Bulldog shots in the first period, blanked Canton on 17 chances in the second period, and completed the shutout with 15 saves in the final frame, including five stops while trying to kill a penalty. After two scoreless periods, Dwyer broke the stalemate 61 seconds into the third. Off an attacking zone face-off, Dwyer slipped in behind after winning the face-off forward and was able to jump on the loose puck and find the back of the net. 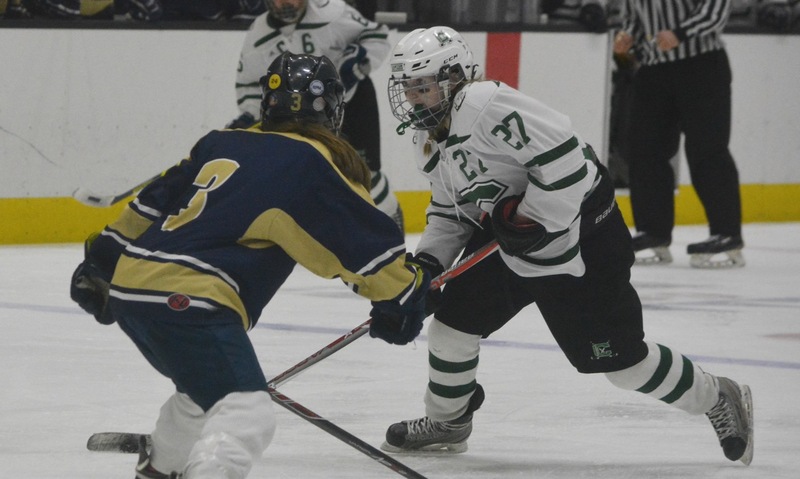 The Panthers nearly had an ideal start when freshman Victoria Quinn batted in a loose puck 20 seconds into the game, but one of her teammates had been knocked into the crease and put Canton goalie Colleen Kelleher out of position. The ref waved the goal off due to interference. 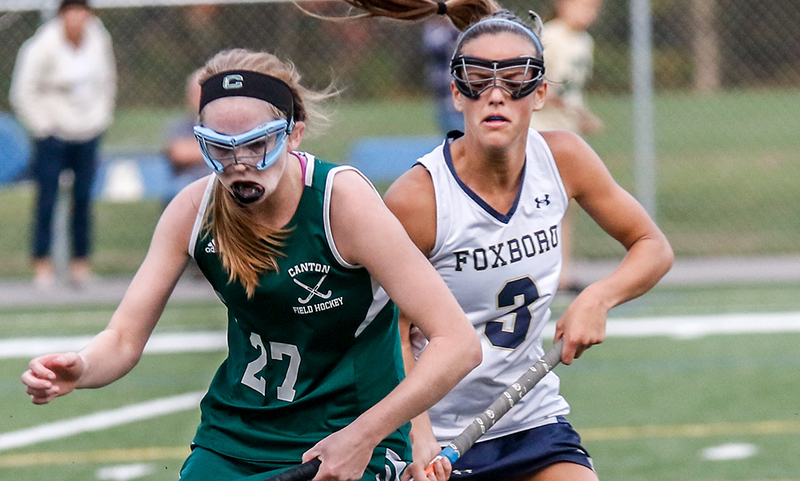 Canton had its best chance of the first when junior Lauren Fitzpatrick broke out of her own zone and into the attacking end, finding Lizzie Tassinari with a pass, but Franklin defenseman Jillian McLaughlin was perfectly positioned to disrupt the 2-on-1 chance. The Dogs continued to pressure Stott in the second period, peppering the goal with 17 shots on target but the freshman didn’t flinch. With nine minutes left, Katie Trerice found Kendra Farrelly in front but Stott denied her with a kick save. Thirty seconds later, Franklin had a bid when Quinn came off the bench for a line change and had a partial breakaway chance, but Kelleher cut the angle down and Quinn’s bid went just wide. It looked like Canton was going to take the lead at the midway point of the period but once again, Stott came up big. Freshman Maria Femia found senior Andrea McNeil out front but Stott made a stop on her high shot. 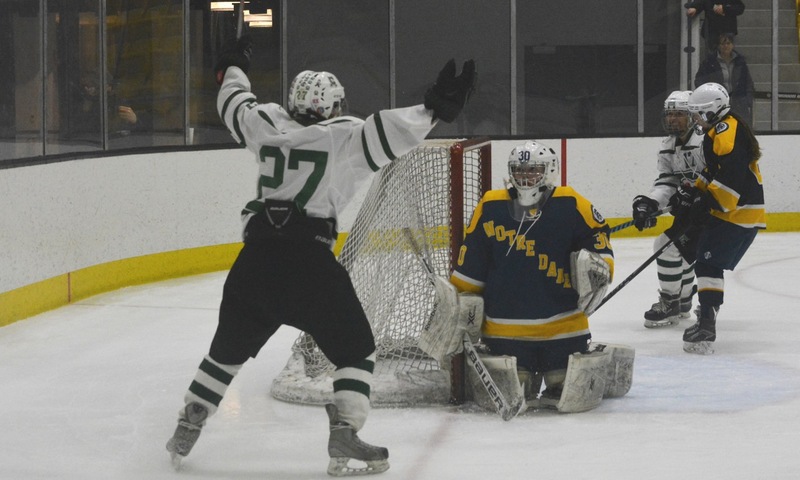 Just seconds later, the puck popped free in front and McNeil had another bid but Stoff made a tremendous save to rob Canton of the opening goal. Fitzpatrick danced her way through three Panthers and fired a wrist shot but Stott made the save and prevented the puck from cross underneath with five minutes to go in the second. On the other end, Franklin’s Jackie Connelly forced Kelleher into a tough save, and the senior made an athletic play to cover the loose puck up. “We’ve done this a lot this year,” Aldrich said of outshooting Franklin 35-10. “We do a lot well but we can’t seem to get it in enough. A lot of the teams we play kind of crowd the front of the net, so you try to spread them out using the defense. And we’ve practiced it a lot. At this point, I don’t know if the scoring is a mental thing because we’re certainly keeping it out of our net. 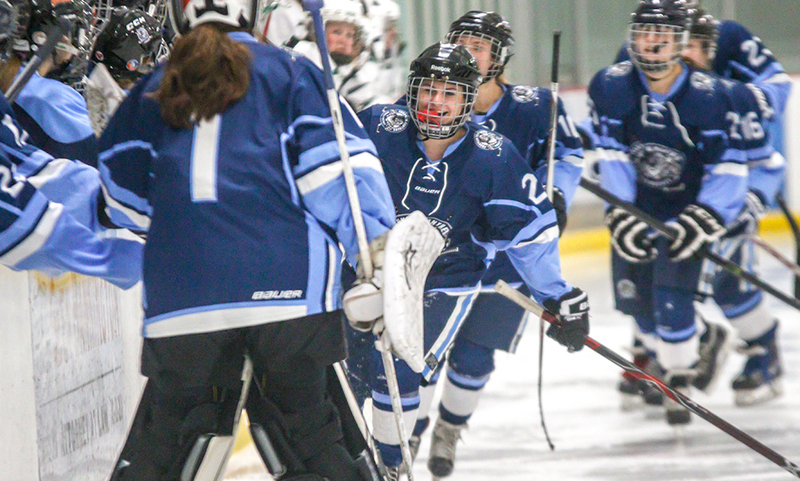 Franklin girls hockey (2-2-2 Hockomock, 11-3-3- overall) is back in action on Saturday when it travels to Gardner Veterans Arena to take on Leominster. Canton (5-1-0, 10-2-3) will try to bounce back on Saturday when it takes on Mansfield/Oliver Ames in a key league contest. Today’s games are listed below. We will make any changes we receive in a timely manner. North Attleboro, 1 @ Foxboro, 1 – Final – Click here for a recap and photo of this game. Taunton, 0 @ Attleboro, 1 – Final – Isabella Salviati scored the game’s lone goal in the first half off a Kara Thornton assist. Attleboro coach Steve Santos said that the seniors “played great” for the Bombardiers on senior night. Oliver Ames @ Mansfield – Postponed to Saturday, 10/28 at 1:00. Sharon @ Norwood – Postponed to Monday, 10/30 at 3:45. Stoughton, 0 @ Canton, 6 – Final – The Bulldogs clinched the Davenport division title outright behind a hat trick from senior Andrea McNeil.